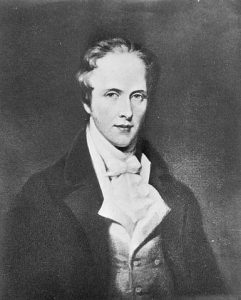 Born at St. Mary’s Isle, Kirkcudbrightshire, Scotland on 20 June 1771, the seventh and youngest son of Dunbar Douglas, fourth Earl of Selkirk. In 1807 he married Jean Wedderburn-Colvile, and had three children. He was educated at Edinburgh University. In 1799 he succeeded to the earldom of Selkirk, his six brothers having died previously. He became interested in the plight of the Scottish crofters and in 1803 established a colony in Prince Edward Island, and a second colony at Baldoon, near Lake St. Clair in Upper Canada. With a view to establishing a settlement in the Red River valley he and his brother-in-law, Andrew Wedderburn-Colvile, acquired a controlling interest in the Hudson’s Bay Company. In 1811 he received from the Company a grant of 116,000 square miles in the Red River valley for purposes of colonization. That year the first party of settlers under Miles Macdonell was sent out via Hudson Bay. The second party followed in 1812. The Selkirk grant was opposed by the North West Company, who saw the settlement as a threat to the fur trade. Open hostility began in 1814, when Macdonell issued a proclamation forbidding the export of pemmican from the territory. The Nor’westers relied on the pemmican supply to feed the fur traders throughout the northwest. They retaliated by issuing a warrant for the arrest of Macdonell. In addition the settlers were raided, crops were trampled and buildings burned. Macdonell submitted to arrest and was taken to Fort William for trial. Meanwhile, one hundred and forty settlers were persuaded to desert the colony for Upper Canada and the remaining sixty-odd retreated to Lake Winnipeg. They returned when HBC reinforcements for the Athabaska region came west, and were augmented by a third party of settlers who arrived in November 1815, with the new Governor, Robert Semple. On 19 June 1816, Semple and twenty of his men were killed by a Nor-wester party at Seven Oaks. Lord Selkirk was now on his way to the Settlement with a hundred Swiss soldiers from the disbanded De Meuron regiment. Appointed a Justice of the Peace in Montreal, he seized the North West Company post at Fort William, confiscated firearms, and arrested the Nor’westers. In June 1817 Selkirk reached his Colony where he met the settlers and made plans for the development of the area. He returned east in October to face charges for acts of injustice and oppression brought against him by the North West Company. The legal proceedings were long and costly. Selkirk lost his case in 1818. He returned to England in failing health and died in Pau, France on 8 April 1820. Two anonymous pamphlets on The civilisation of the Indians of British North America (London, 1807) have also been attributed to him.